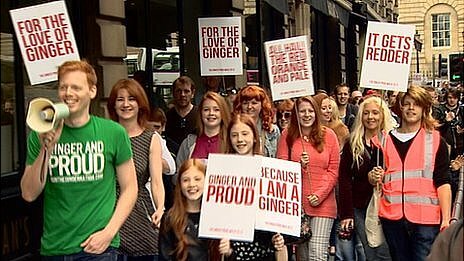 A BBC news article informs me that Jackson and I recently missed a first-ever "Ginger Pride" march in Edinburgh, part of the Edinburgh Fringe Festival. It was a tongue-in-cheek event, to show pride and prevent bullying against people with red hair. "Ginger" is the more common term here for redheads. Oppressed gingers marching in Edinburgh. Jack has strawberry blond hair. We tend to keep his hair pretty short, but the longer it gets the more the red is apparent. Playing in the evening sun on the beach outside St. Andrews. Learning to use chopsticks at a Wagamama in Glasgow. Do I have red hair? Not really. At least, not anymore. My hair was blond when I was young. As I got to school age, my hair turned quite strawberry blond; my friends through high school and college would likely describe me as a redhead. It was good for picking up chicks. As I've aged, however, my hair has turned browner, and I think most folks would describe me as having brown hair. Nowadays, it's only if the light hits my hair just right that you see some red. See any red left in my hair? Nope? Me either. The article also asserts Scotland is home to almost 1/5 of the world's redheads. One fifth! An older BBC news article says 13% of Scotland's population has red hair. 650,000 people. That's more than 1 out of 8 Scots. Wow. I did a tiny bit further digging -- y'know, performing high-level research via Google and Wikipedia -- and learned that only about 1-2% of the world's population has red hair. Owing to its large population and western European immigrants, the U.S. has the highest number of redheads, somewhere between 6 to 18 million people and 2-6% of the population. Scotland has the second most redheads (650,000) and the highest percentage of redheads in the world at 13%. Apparently, Ireland has around 9-10% of its population with red hair. I do see a good number of redheads here in Scotland, although I would not have guessed it was 1 out of 8 people. Maybe there are more folks with red hair up north in the highlands. Or perhaps a lot of people have hair that has lost much of its red, like mine. I am a bit surprised that the Scots are redder than the Irish. Apparently, we gingers need "pride" parades to keep up our self-esteem. What could possibly be a more important issue facing Scotland today? Gingers unite!